In the wake of the recent tornadoes and the loss of sheds, I’ve had to rebox some of the books I’d had stored out there. Lost quite a few of them that I’d had since high school. But while rescuing what I could, I found books I hadn’t read in years. 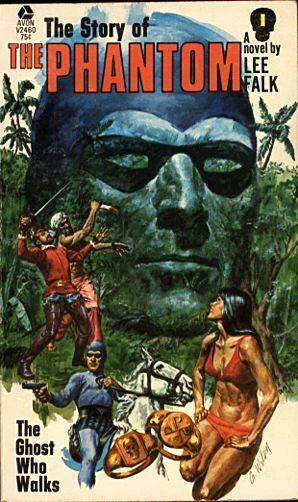 Some of the ones I saved were Lee Falk’s Avon paperback series about the Phantom. As I recall, most of the paperbacks were loose adaptations of story plots in the newspaper strips. Some are good, some are not so good, but I remember being overall happy with the books back in high school. Maybe I was just impressionable, but as I lifted those books out of a bedraggled box, I was transported back to the jungles, listening to the drums beat out warnings to the Phantom’s enemies. For those of you who don’t know the character, Lee Falk invented a heroic mythos about a young cabin boy who swore on the skull of his father’s murderer to fight evil. Not only that, but he swore that all his descendants would do the same. The Phantom was also known as The Ghost Who Walks, The Man Who Cannot Die, and other names. I sat down with the first book, the story of the Twenty-first Phantom (they’re all named Kit, presumably for Christopher and known by their known designations). This is a coming of age story, broad and sweeping, about the Phantom of our generation (although he was created back in 1936, which would make him roughly 100 years old, but fictional time is a fluid thing). Starting with the Twenty-first’s birth and continuing on till he takes on the Phantom mantle at twenty-two, the book covers a lot of ground and introduces a lot of Phantom lore, one of my favorite facets of the novel. The writing is loose, more telling than showing, but the pacing moves along so quickly that I sat enamored through a story I’ve read three or four times before, in prose as well as comics. I can’t help but compare the jungle sequences and action to Edgar Rice Burroughs’s Tarzan, and I think the comparison is warranted. The Phantom is as much a jungle hero as he is an urban crimefighter. There’s zero action of the Twenty-first in the Phantom uniform, and I missed that, but the story of young Kit Walker is absorbing and just fun. I loved romping through the jungle with Kit and Guran, I sat mesmerized as the Twentieth told stories about the Phantom ancestors related in the pages of the Chronicles, and I enjoyed the part of the story set in America when Kit went to school. Honestly, several novels could be written about the events only hinted at in the book, but this is a good primer for those unfamiliar with the character or those who want a good refresher. The Phantom is an iconic hero that will never go away. Even now, 77 years later, newspapers still carry the strip, and readers still thrill to the Phantom’s adventures. This entry was posted on July 5, 2013 at 5:58 am and filed under Adventure,Comics Related,Juvenile,series fiction,Superhero,Young Adult. You can follow any responses to this entry through the RSS feed. You can leave a response, or trackback from your own site.